It’s a common question we get asked a lot. ‘Why do I need a financial advisor?’ And it certainly isn’t a question without merit. Our industry has had a few bad apples that have made national news since the 2009 Financial Crisis. With household names as Madoff, Sanford, and Parrish, among others, we too can understand why you would hesitate to trust another person with your money. 3 Reasons why we believe you need a financial advisor. Reason One: You don’t know what you don’t know, until you know it. There are a lot of mistakes we all make with how we manage our daily wallets and these financial mistakes usually aren’t made on purpose. I commonly say, “you don’t know what you don’t know until you know it.” Why do I need a financial advisor? A Financial Advisor can help you learn new methods of the financial world that you haven’t learned yet. You go about your day with a common goal to earn more, spend less, and make life better for your family and others that you love. But there may be financial concepts that you just don’t know because life is an educational journey; one in which you are constantly learning. A Johns Island Financial Advisor can be your financial educator to help teach you how to manage your money with your long-term, best interests in mind. It’s really easy to get lost in the tiny transactions of life and lose the big picture of how your daily habits add up and affect your much larger financial goals. With a financial advisor by your side, you have a resource you can use to help you make more informed financial decisions. Reason Two: Advice on Managing Investment Allocations and Risk Tolerance, Specific to You. If you’re like most people, you’ve been told that your biggest assets are your home and your retirement plan (401k, 403b, etc.) at work. While these are big and important, we believe your biggest asset is your future earnings potential. This assets is like the hammer of your financial tool box; it’ll likely be the most used component in your financial projects. How you allocate your earnings, meaning where and how much you spend, how you choose to invest in a particular security, mutual fund, ETF, stock, bond, etc. has a dramatic effect on the possible outcomes of your financial life. Why do I need a financial advisor? A financial advisor can help show you the long-term effects of your financial choices through the development of a financial plan and investment strategy that’s appropriate for your tolerance for risk. The investment advisory world is highly technical, complicated, and involves great risk, up to and including the loss of 100% of your hard-earned money. 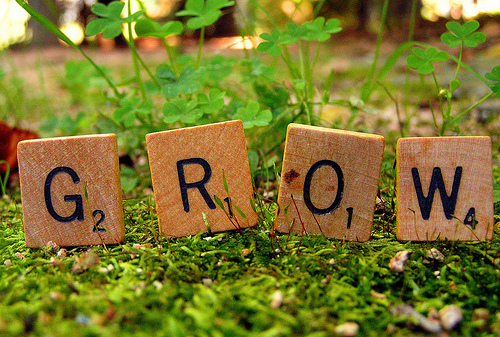 We believe you shouldn’t leave the results to chance and should develop your own plan. Over the years, many people have tried to simplify it through crafty rules of thumb, but the reality is that financial advice is only good for one person at a time; it has to be tailored directly to you and your specific situation. Reason Three: Your Time is a Precious Resource. A long time ago, someone decided that there would be 24 hours each day. And it’s time you start believing that your time, just like your money, is a precious resource. You only have a limited amount of it. The financial world is full of IRS rules, financial data, expense ratios, risk, and numerous other often confusing and complicated concepts…and the worst part, they are constantly changing. It’s a full-time job just keeping up with it all! As your wealth grows, your life doesn’t get simpler like most people think, it gets more complex. Why do I need a financial advisor? A Financial Advisor has the tools and methods available to help you manage your financial life and limit the amount of time you spend on it. A small investment into a fee based financial advisor cost could save you a lot of time that could be spent doing activities that you actually enjoy. Afterall, we believe true wealth are the memories we build with the people that we love. We work with our clients to define their long-term financial goals and then build action-based savings and investment strategies to help them accomplish those goals. Our financial planning process has helped others and we believe we can help you too. We have a fiduciary duty to our clients. This means we must do what is in your best interests, regardless of our own interests. 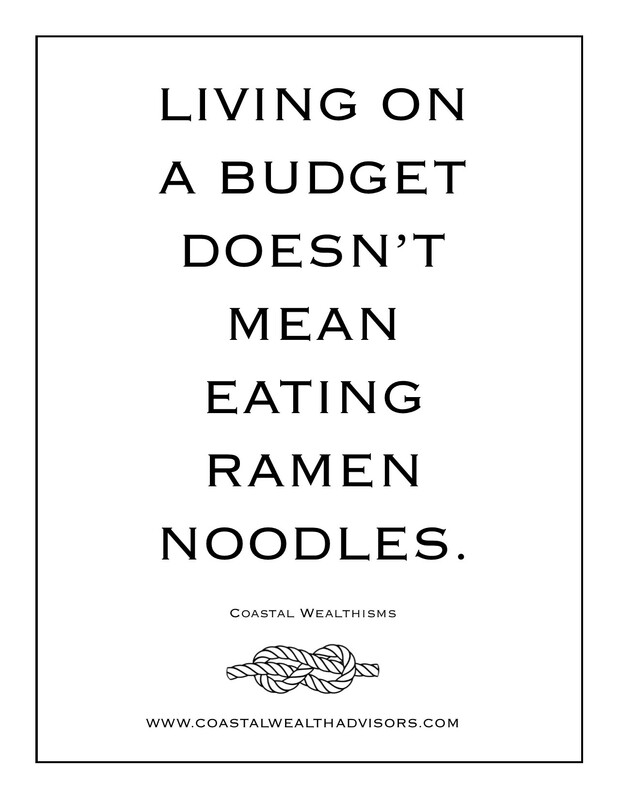 Living on a budget doesn’t mean eating Ramen noodles. A well defined, planned, and tailored budget is your way of navigating your financial life. But don’t just list your income and expenses in a boring format. Add cool line-items, pictures, and animation in there that are fun and unique to you. We’ve helped clients build budgets that include items like “ef it all, I want that!” and “future wife expense” among others. Don’t make budgeting into this giant mountain when it’s really a mole hill. And budgeting isn’t just for your parents, think of it as the reason they have money. Living on a budget is simply a structure for where you’re going to spend your money next month – if it’s spent on gourmet dining, so be it, just budget for you. Need some guidance and help putting your budget together? Get in touch with us. We love putting together unique things. Most people don’t like talking about the things we as financial advisors talk about. 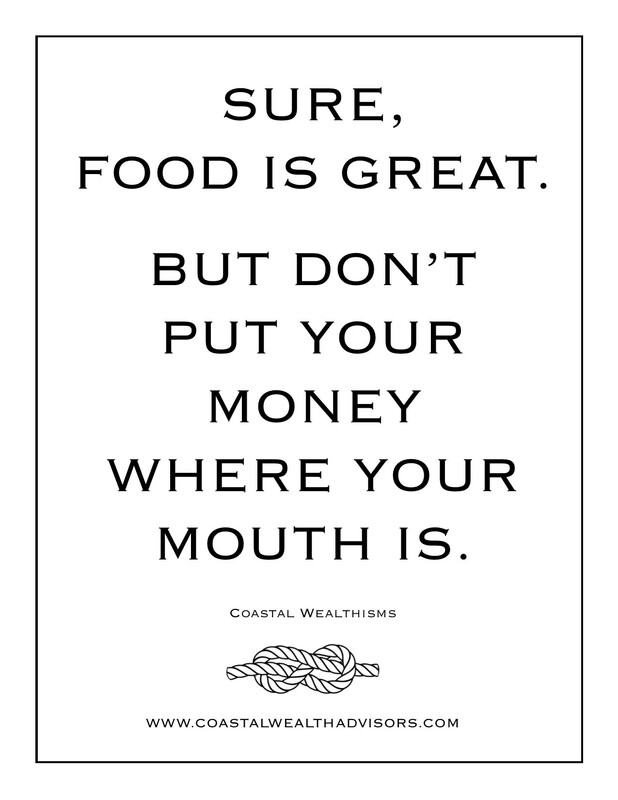 Topics of death, health, money, debt are all routine and normal discussions at our Johns Island Financial Advisor office; just like when you talk with your spouse about dinner, the kids, that new bag you want, or this weekend’s house project. Nothing here is off limits. And we don’t judge. 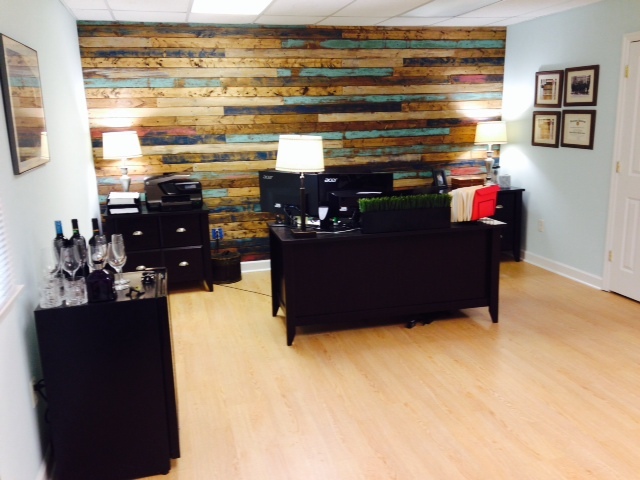 So when I sat down to design the layout and feel of our space, I knew it had to be different. Just as we are unique, our office would have to be as well. 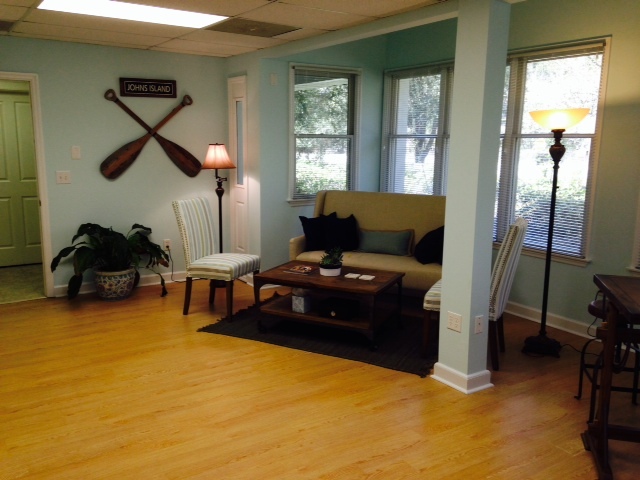 I started my Johns Island Financial Advisor firm Coastal Wealth Advisors with a vision of creating a unique meeting space that was welcoming, different, and relaxing. I didn’t want the traditional boardroom conference table, stuffy leather chairs, outdated projector, and large, mismatched metal filing cabinets to be the backdrop of the highly personal and sensitive types of conversations we have as par for the course in the financial planning and investment advice business. And what better way to develop ideas than by browsing Pinterest. I already knew the color palette from my logo designer Scotti Cline Designs. I also knew I wanted a rustic modern industrial appeal (still not sure if rustic modern industrial is a thing – but if it’s not, it is now.) This meant reclaimed wood, the look of wrought iron, linen, a few coastal touches, bright and dark in harmonious attraction, the convenience of the latest technology, with the comforts of a living room. And I think I pulled it off. 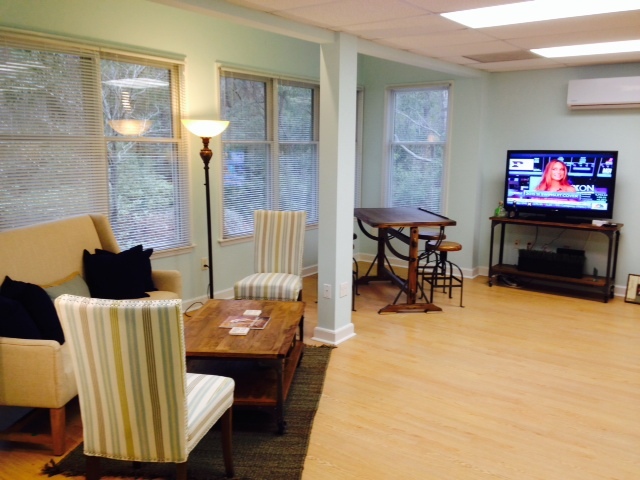 I wanted a lounge area for financial planning discussions; the first step of Our Process. Driftwood fish, local Charleston photography, book shelves complete with Coastal Wealth’s Reading List, wrought iron and reclaimed wood coffee table, local Charleston coasters, and linen couch. Real plants. Nautical knot door stopper. Pub Table for paperwork and financial planning review. Wrought iron bar stools and TV console. Lots of windows for natural light. 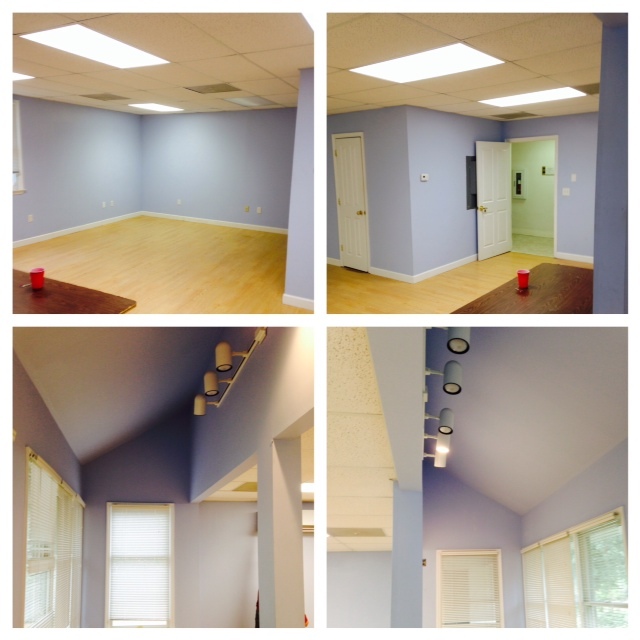 Wall color is Retiring Blue; fitting for a retirement planner. Pull up a chair and a pillow. Grab a book. Let’s start a conversation. What are your financial goals and dreams? What are you afraid of? I had to find a way to tie the driftwood and industrial feel into the design. So I #manterest the wood wall from various posts I found. Process began with 1×4 spruce furring strips at Lowes. A little paint of various color palette shades here and there, let dry, then sand to allow wood grain to show through, followed by a medium-colored stain. Viola! I’m very pleased with the outcome and the overall design of the space. I hope it’s an inspiration to you. You can take something rough, unkempt, and non-existent and with a plan, some hard work, and some help, turn it into something beneficial, pleasing, and exciting. I believe this is also true with financial advice. What can seem overwhelming and unorganized can quickly become the opposite with a financial plan and some investment help. That’s what we do and we believe we do it well. 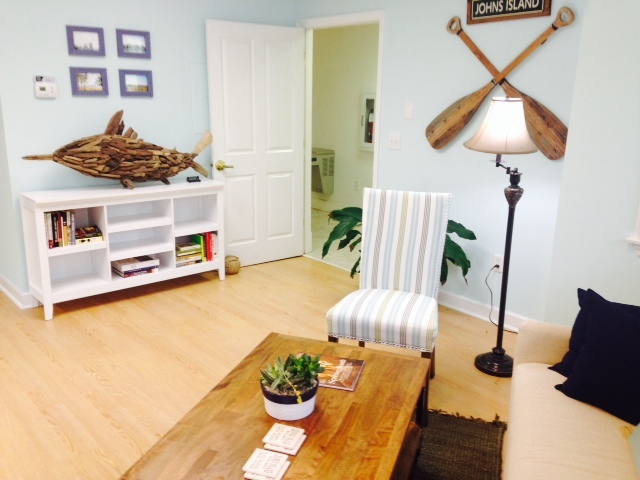 Stop by our office to check out the space and while you’re here, let’s start a conversation. A few minutes on the phone or in person may be the best few minutes you’ve spent all week. 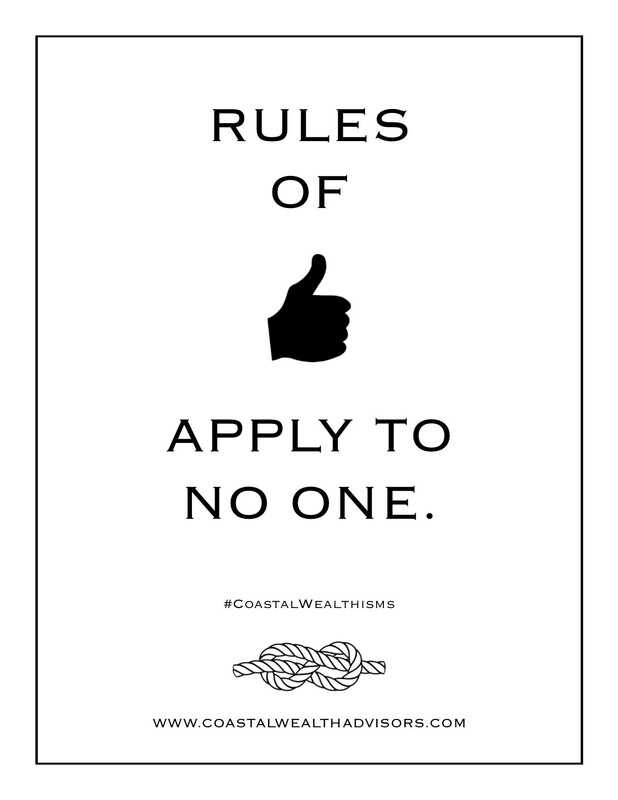 Copyright © 2019 · Coastal Wealth Advisors. Coastal Wealth Advisors, LLC is a Registered Investment Advisor in the states of South Carolina, Pennsylvania, and New Jersey. Any reference to Dimensional Fund Advisors is for illustrative and research purposes only. Dimensional Fund Advisors is a Registered Investment Advisor with the SEC and is not affiliated with Coastal Wealth Advisors, LLC. Investing involves risks such as fluctuating value and potential loss of principal value. There is no guarantee that these strategies will be successful. Diversification neither assures a profit nor guarantees against a loss in a declining market. Past performance is no guarantee of future results. Nothing listed on this website should be construed as specific investment advice; we welcome you to contact us to tailor advise to your specific financial situation.